Among the themes that have recurred through the various events covered on this blog, an interest in the lives of citizens caught up in the Great War has been prevalent. Often far removed from the decision makers of European governments and powers, the stories being told of soldiers, nurses, farmers, parents and children have proved popular with writers and audiences alike. Perhaps it is the loss of first hand experiences that captures the imagination: now we no longer have anyone to tell us ‘what it was like’ we are more keen than ever to find out. Historians, spurred on by their own interests and perhaps those of their publishers, have new resources at their disposal – fuelled by rediscovered archives, connections forged over the internet and a desire to help mark the centenary of the conflict. Florian and Dedio and Gunnar Dedio presented a small slice of their contribution to the presentation of everyday life in and around the First World War. Their ambition is to present the war from a transnational perspective, delivered through a series of films and an image-rich book. Over the course of their hour at the Book Festival they presented and explained the origins of their sources, the approaches they adopted in their work and made an international project directly relevant to their Scottish audience. Their work draws from diaries and letters written across Europe, picking out themes that are common to those on all sides of the conflict. 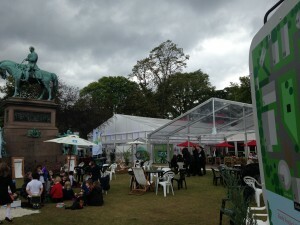 Some 26 broadcasters were involved in creating and presenting the work, including the BBC and BBC Alba. The resulting films combine archive footage with modern reconstructions, using words from those diaries. Archived films were rescanned using modern techniques, which bring out the clarity and detail of the originals. Alongside the live action, still images also feature heavily in both the book and the films. Many are from an collection of glass plates that has recently been uncovered in Germany: ground breaking work which saw the glass positives of the images ‘colourised’ by artists painting in very fine detail on the reverse. The results are captivating, all the more so as they were originally presented in stereoscope through special glasses: two images, which gave the impression of 3D when viewed together. There was a lot to get through in the time allowed, from the philosophy behind the project, to the techniques used in its production and the nature of the materials being drawn from. Florian and Gunnar were never less than enthusiastic and engaging. They have travelled many miles to compile the project and to share it with audiences across Europe. BBC Alba requested a Gaelic version, which was duly delivered. Both adult and child versions have been made of the films, speaking to different audiences. The morning audience in Edinburgh was shown clips from the films, examples of the photographs and excerpts from the original diaries used in the project. And still there was time for questions at the end. There was a solemn mood for much of the event, both from the content of the diaries and the realisation that for many of their authors these were among their final thoughts and messages to those back home. It was imbued with a modern sensibility though, with Florian pointing out that our collective picture of World War I is based on a relatively small selection of images, when in reality there are millions out there. Europe in the 21st century is growing accustomed to a life that is captured and shared through countless small lenses and an array of online platforms. Modern conflict is viewed through the same tools, with near instantaneous availability across the global network. What we require today, yet too often don’t have the opportunity or time to access, is the careful, considered and contentious sifting of the material that will help us make sense of the world around us. Events come and go and we engage all too fleetingly, their significance can easily be lost to us. What we learn from Florian and Gunnar is that the magnitude of great events can also be overlooked, for a century or more, yet with time, patience and collaboration a richer story emerges and is made accessible across the borders that once divided us. 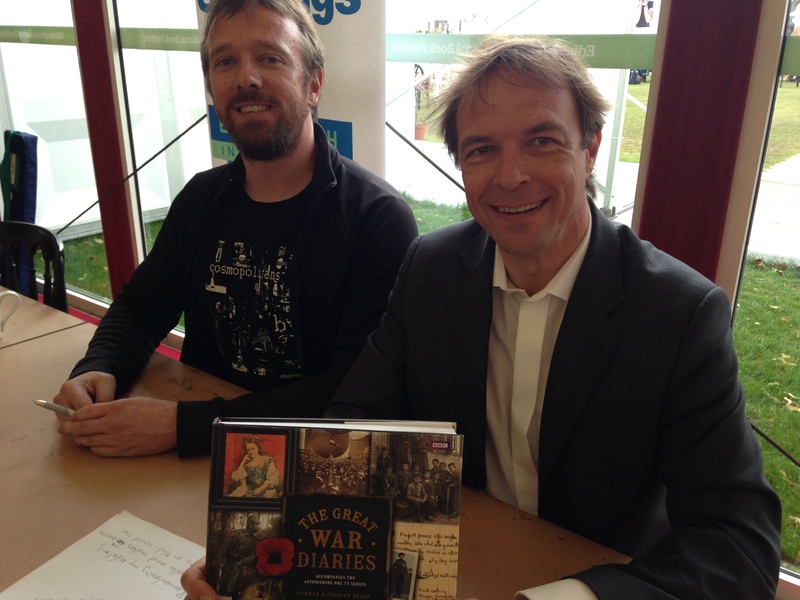 This entry was posted in Edinburgh International Book Festival, World War One on 31 August 2014 by davidjarman.